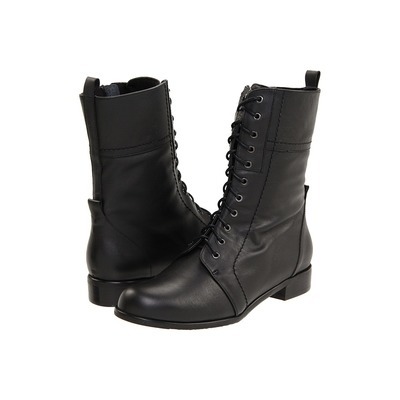 March around with stylish authority in the must-have Military boot from Ros Hommerson®. Smooth leather upper with military-inspired silhouette offers a fashionable, rugged appeal. Inside zipper closure with lace-up detail provides a customized and easy fit. Soft textile lining aids in drawing moisture away to keep your feet dry and healthy. Lightly padded footbed provides increased shock absorption, comfort and support. Textured man-made outsoles provide non-slip grip with each step you take. British Walkers shoes were first created during 1950â€™s in England with Natural Crepe Sole and high quality and fashion. It was during 1970â€™s that Britisherâ€™s were introduced to USA. Since then it became famous and Desired by all New Yorkers for its comfort and quality. Hip-hop stars and celebrities chose British Walker shoes for itâ€™s fashion and its unique look. Since then these shoes acquired their own name by people such as Bwalkers, Bboys, B dubsâ€¦! Since 2012 â€œBritish Collectionâ€� by British Walkers Inc. started to recreate the same comfort, fashion and quality shoes. We brought back British Walker shoes with dual fit tech for better fit and Crepe Sole for ultimate Comfort! British Collection shoes are designed in England and hand crafted with high quality leathers overseas. British Collection are not only shoes, they are a culture for fashion!